The diaper covers I made for the new baby turned out well. I've got a cream coloured baby kimono on the go and a pair of green longies ready to cast on next, and I think that's all I'll get done for the baby before he or she arrives, maybe a matching hat or two out of the leftover yarn. I'll be 37 weeks this Saturday - full term! Mods and Specs: Size small; no short rows; picked up 42 stitches for the cuffs. 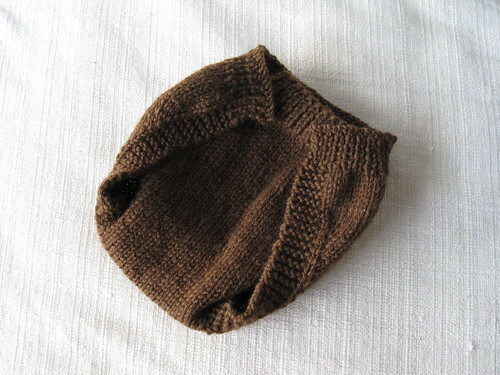 Mods and Specs: Size small; used 1x1 ribbing instead of twisted rib. Those are very cute! I have those same patterns in my favorites on Ravelry. I came across the longies pattern that you use. Do you find it easy to do and easy to read the pattern? I'm still learning how to read pattern and to actually understand them. I'm eager to make some longies for Grayson. I've looked at so many patterns. Adrian, I found the longies pattern quite easy to use. It was my first "real" project last fall and while I had to learn a bunch of new skills while doing it, the pattern has links to some excellent online tutorials for each of them. The pattern comes with two options, top down or bottom up. I personally found the bottom up one easier to do, but the top down one seemed to look better at the end, more of a cleaner appearance. But maybe it was a difference in the yarn I was using rather than the pattern version, I'm really not sure. We're doing a knit-along with the AP group (on Meetup as well... were you part of that one too?) for some who wanted to learn and we spoke of longies and soakers - it seems perfect for that too! :) Thanks for sharing! These are so cute. 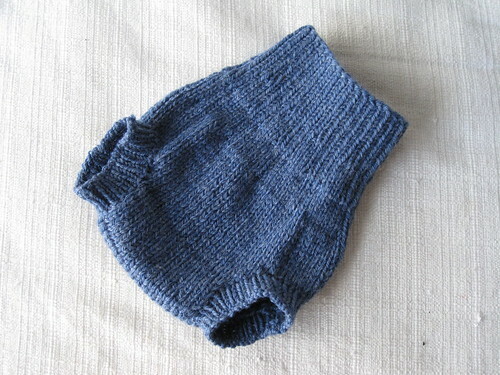 I don't have babies to knit for, but one day. Hi, your projects are awesome! Thanks for sharing. I was wondering if you have an updated link or if you could please send me the Warm Heart Woolies Plain Wrap pattern? The website seems to not exist anymore? That would be sooo awesome! Thank you. Have a wonderful weekend.